This good-as-new, fully-furnished 52 sq.m. penthouse apartment is 13 minutes walk from Bansko town centre. It has easy access to the Pirin Mountains (400 metres from the gondola lift for winter skiing and snowboarding and summer hiking) to Pirin Golf & Country Club (15 minutes away by cheap taxi) and to the numerous attractions of Bansko itself: 1000s of years of history, shopping, mehanas (taverna-type restaurants - some with live music), extensive street markets, bars and museums. There is a convenience store/pavement cafe next door. Nearby hotels offer other facilities to non-residents. Bansko International Jazz Festival takes place in August. Pirin National Park, its entrance only about 1.5 km from the apartment, is 274 and a World Heritage national park. Numerous lakes and the old pine woods make it a popular area for recreation. 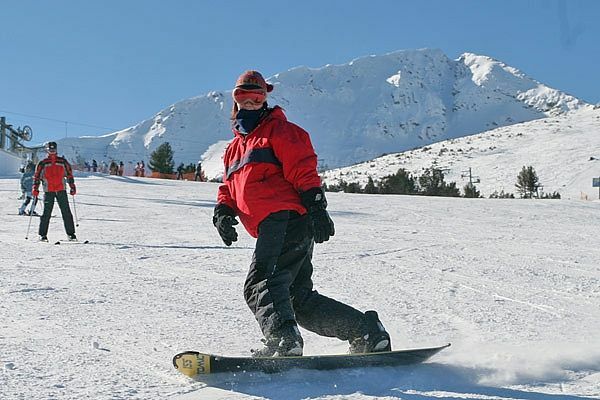 Bulgaria offers great value for money and Bansko is one of its highlights. Neil is a Londoner who has travelled to over 70 countries around the world, including most of those in Europe, and has skied in Finland, France, Germany, Switzerland and the US as well as Bansko. I was so impressed with Bansko on my very first trip to Bulgaria that he immediately paid a deposit to buy this apartment off-plan: it has a sunny, south-facing aspect and wonderful views of the mountains. It is located in a quiet side street, only a short walk to the gondola lift base station and to Pirin Street, for shopping and restaurants. I come back here every year. Large and beautifully-tiled, containing wc, shower cubicle, hand-basin, towel rails and shelving for bathroom items. The heating in this room is individually adjustable. The extractor fan has its own on/off control. This has a 32" Full HD flat-screen TV with 100s of international satellite channels, DVD/CD player, LW/MW/SW/FM radio, two sofa beds (one single, one double). The heating in this room is individually adjustable. The kitchen area has: a combination microwave oven-grill, a toaster, a toasted sandwich-maker, a fridge, a clothes washing machine, two electric hobs, an extractor fan, a dining table, four dining chairs, crockery, cutlery, tea towels and oven "glove". Bansko Town is around 925m above sea level. From the southwest corner of town (400m from the apartment) the gondola lift, built in 2003, takes you directly up the mountain to Bunderishka Polyana, at 1630m above sea level. Altogether Bansko boasts 65km of ski slopes in winter, for all ages and abilities, mostly between altitudes of 1800m and 2500m. The ski season normally lasts from mid-December until mid-April, sometimes as late as mid-May. 130 million euro was spent on the ski-lift system, which continues to be developed. Your own skis and skiing equipment can be stored overnight during your stay in the security room on the ground floor of the apartment building. Pirin Golf & Country Club (Ian Woosnam) is about 15 minutes drive away by economical (metered) taxi. We understand that club facilities are open to non-residents, that prices during the week are lower than at the weekend and that there are special rates between 1pm and 4 pm. Outside: The building has 24-hour security, and parking spaces for residents. There is a supermarket/pavement cafe next door (up the street). Depending on when you plan to arrive, you may wish our local representatives to arrange a Welcome Pack (tea/coffee, milk, bread, butter, honey, wine etc.) waiting for you. Please state your preferences and ask us for a quotation. Cleaning / Towels / Linen / Maid service: The supply of towels and bedlinen is included. Cleaning of the apartment and changing of towels and bedlinen normally takes place weekly, but can be more frequent, by arrangement with our local representatives. We had a wonderful stay in this apartment during the summer. The apartment had everything we needed. The kitchen was fully equipped. The bed was nice and soft. There is a fantastic view out the window. The apartment is on the 5th floor and there is no elevator- so expect a workout. There are small markets nearby and several restaurants. During the summer, much of the town is deserted, many shops and restaurants are closed. The center of town is about a mile from the apartment. There is no public transportation in the town but there are cheap taxis, but we usually just walked through the charming streets to get to our favorite coffee shop and bar. There was a week long jazz festival and a three day opera festival which were held for free in the town square while we were there that livened up the sleepy town. The people are very friendly and many speak English. True there is no lift/elevator but the apartment is only three and a half floors above the entrance hall (not on the 5th floor as stated in the review). The apartments at one end of the building are half a floor above those at the other end, because of the sloping ground. As well as to/from the UK, Sofia Airport has direct flights (many low-cost) to/from: Austria, Belgium, Cyprus, The Czech Republic, Denmark, France, Germany, Greece, Hungary, Israel, Italy, The Lebanon, Malta, The Netherlands, Poland, Romania, Russia, Spain, Sweden and The Ukraine. It takes 2.5 hours by car or coach from Sofia to Bansko. There are also airports at: Kavala, Plovdiv, Skopje and Thessalonika. Taxis/private hire available at airports and Bansko. Bansko is 160km south of Sofia, 80km from Melnik, 80km north of the Greek border and 80km east of the FYR of Macedonia border. Choose from: golf, hunting, fishing, hiking, mountain biking, and excursions in summer. The Bansko Jazz Festival takes place in August. Bansko station is served by a scenic narrow-gauge mountain railway, which operates all year round and stops at all the villages between Septemvri and Dobrinishte. It is possible to take a local excursion or even to go all the way to or from Sofia (by changing at Septemvri). Fares are very cheap (about £4 to/from Sofia) but the total journey time would be about 7 hours, much longer than that by car or coach. The village of Banya, located only 5 km from Bansko, is renowned for its 27 thermal mineral springs. The town of Razlog is also a few minutes’ drive from Bansko, but has a completely different atmosphere. If you wish to travel further afield, by hiring a car or chartering a taxi, Melnik is renowned for its wine. Greece lies a little to the south of Bansko and the Former Yugoslav Republic (FYR) of Macedonia a little to the west. Our local representative in Bansko is also a travel agent and will be delighted to quote for any trip you may be considering, including airport transfers. English is widely spoken and included on many restaurant menus in Bansko. A basic lunch for two can be had for around £13, including a bottle of local wine. Wine has been made for thousands of years in Bulgaria and some it is very good indeed, as is the local lager. Local fruit, vegetables, meat, fish and herbal teas are also of excellent quality. Booking Notes: The apartment rental rates are quoted in Euro. GB Pounds are accepted at the current exchange rate. A 50% non-refundable deposit secures any booking: the balance must be received 28 days before arrival. Notes on prices: The price for a booking straddling different rental rates will be calculated pro rata.